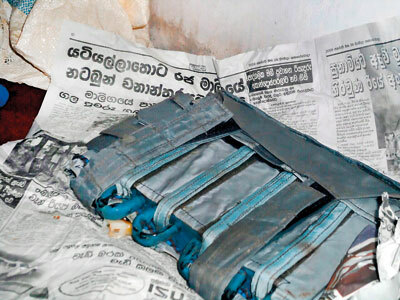 The suspect arrested over the detection of a suicide jacket, explosives and ammunition in Chavakachcheri, Jaffna was brought to Colombo yesterday for further investigation by Terrorism Investigation Department(TID) officials. The TID came to the scene after Acting Inspector General of Police (IGP ) S. M. Wickramasinghe handed over the investigation to the anti terrorism unit of the police under the supervision of a senior DIG. Based on a tip-off, the police recovered from a house located at Maravanpulo, Chavakachcheri, a suicide jacket, four side chargers, three parcels containing about 12 kilograms of TNT, two packets containing 100 rounds of 9 mm pistol ammunition and two battery packs used to detonate side chargers. 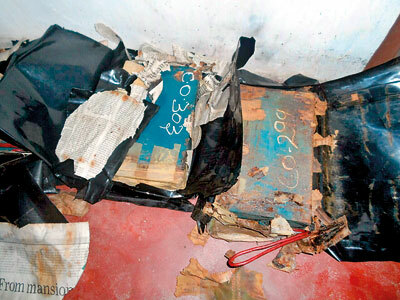 The explosives had been wrapped in a old Sinhala newspaper dating back to 2008. The house owner, identified as a former LTTE cadre, had fled the area but police arrested him in Kilinochchi. His wife was also arrested and later released following an inquiry. A Defence Ministry official said that last month alone at least ten thousand military materiels related to war were found in the North and East. “This kind of isolated incident does not pose any threat to national security,” he said. Meanwhile former Foreign Affairs Minister G.L. Peiris yesterday appeared before the Criminal Investigation Department (CID) following his remarks over the incident that those explosives were to be dispatched to Wellawatte. Mr. Peiris said at a press briefing this week that he was aware that the explosives were to be transported to Colombo from Chavakachcheri and claimed that this was a serious threat to national security.